This post is in collaboration with and sponsored by Sephora inside JCPenney. If you're following along on my Instagram stories, you know I have been talking about wellness quite a bit lately. When it comes to training for a marathon, everything is evaluated in regards to if it's necessary in my diet OR if it can go. What benefit is it bringing into my life? Since partnering with Sephora inside JCPenney, I have been trying some skincare products with feel-good ingredients like mushrooms, natural acids and teas. These ingredients help nurture gorgeous and healthy skin. Make sure to tune in to Instagram stories next week for my in-store makeover at Sephora inside JCPenney. Now let's dive into each of these six products. This is one of the best solutions for redness and oiliness, both of which plague me throughout the year. When it comes to this mask, the antioxidants help to feed the skin a multitude of health benefits including reducing redness and inflammation. Usually this inflammation and redness is caused by environmental free radical damage. This mask is detoxifying, decongesting, and helps to de-stress the skin with matcha green tea. Love using this when my skin is overly irritated. With this particular mask, it's possible to target dullness and uneven texture, dark spots, uneven skin tone, fine lines and wrinkles. This is the perfect all in one mask. This formulation is so lightweight and doesn't feel overly thick and heavy on the skin. With two types of vitamin C: water-soluble vitamin C absorbs quickly for immediate glow and an oil-soluble vitamin C that stays in skin longer, which gives antioxidant protection from UV damage for a brighter, more even-toned appearance over time. The mask is also powered by the Japanese beautyberry which is a superfruit rich with antioxidants that was found to stabilize vitamin C, maximizing its effectiveness. One of the best things about purchasing Tatcha products is that every Tatcha purchase you make supports girls’ education around the world. Tatcha partners with Room to Read to transform girls’ futures. When it comes to this essence, it's good for all skin types. This is a potent age-delay essence, powered by kombucha, which protects the skin with antioxidants, enhances that luminous glow, softens the appearance of fine lines, and helps to get that moisture back into the skin. I use this for the lines and wrinkles, any dullness and uneven texture and of course to make my pores appear less prominently in every photo I take! This is also lightweight and doesn't feel heavy on the skin. Given this is an essence, you apply this over freshly cleansed skin to prep for serum and moisturizer. This is such an interesting product because it reminds me of an essence, but it is a lotion. However you apply this lotion with a cotton pad, which is a unique application. It's got the consistency of a toner or essence so don't be surprised with that consistency difference. It rehydrates like a charm, and makes my skin glow after just one application. When it comes to this resurfacing mask, it's super helpful for cleansing the pores, improving dullness and uneven skin tone and of course, uneven texture. I suffer from each of these, but it gets worse in the summer and winter time. Not only is this great for combination skin, but it can be used on normal or oily skin making it extremely versatile. This mask is packed with 27.5 % AHAs/BHAs and active natural skin resurfacers which help give more glowing skin with smaller pores. Not only does the mask help to exfoliate the skin, but the glycolic acid and enzymes help to remove and peel away dead skin cells. It's one of my favorite things to peel away dead skin, because you get that smooth baby soft skin afterwards. When it comes to this cleanser, I am literally obsessed. I haven't found anything better that works quite as well and I love the consistency. Not to mention the tingly sensation as the cleanser gets under my skin to cleanse the pores. 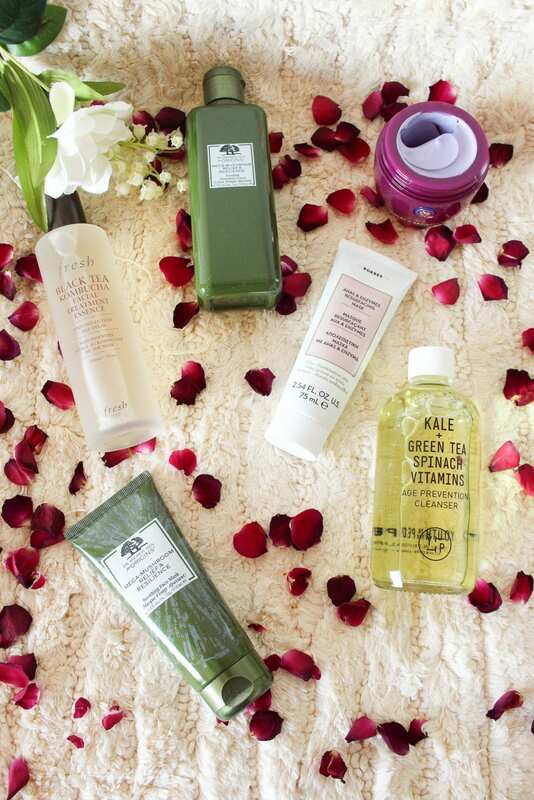 This is antioxidant-rich gel cleanser made with kale, spinach, and green tea. All of these ingredients help to balance and remove toxins without stripping the skin making it dry or lackluster. Love this stuff and how it deeply cleanses! One of the three wellness ingredients is tea. It helps the skin protect against environmental damage with antioxidants. 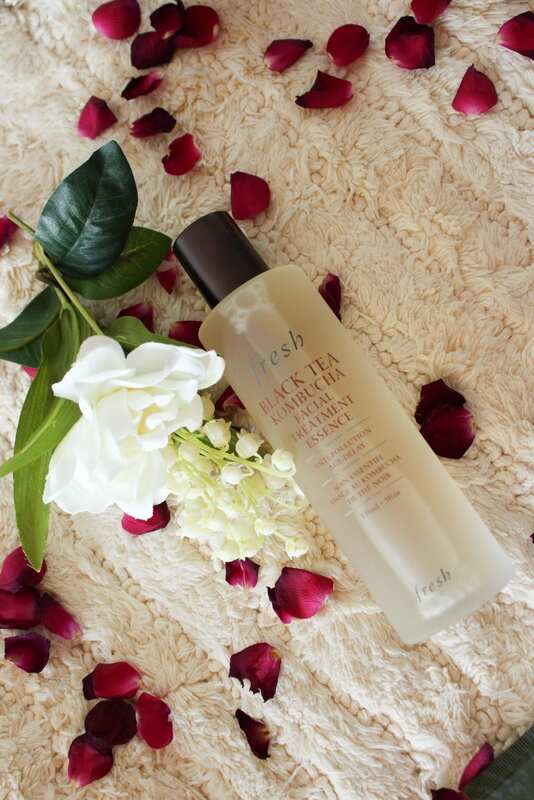 The Youth To The People Green Tea Cleanser, Boscia Match Magic Mask, and the Fresh Black Tea Kombucha all feature tea. The second ingredient is mushrooms which helps to get youthful, calm skin. Mushrooms reduce inflammation, redness, and wrinkles. Win, win right? The Origins Mega Mushroom Treatment Lotion and Origins Mega Mushroom Serum are the two products specifically with mushrooms. When it comes to the third ingredient, natural acids help to get more radiant, exfoliated skin. Tatcha Violet-C Radiance Mask and the Korres Pomegranate AHAs & Enzyme Resurfacing Mask both help to dissolve dullness and get that beautiful glowy skin. Have you shopped at Sephora inside JCPenney? What's your fave skincare product at the moment?